You’ll have to look closely to see that man walking along the branch. “There are men climbing around in the top of your tree!” Darla reported with excitement when I answered the front door that morning. She knew the tree surgeons were coming to remove our giant oak that day, but the sight of them working in the lofty branches was still amazing to her. “I’ve been afraid to look,” I confessed. “DON’T! Don’t look!” Darla knows how nervous I can get. Despite this good advice, a few hours later I could not resist stepping outside to see how things were going. Through our large back windows, I had seen HUGE branches lowered to the ground by the crane, so I figured they might be getting to a point where most of the tree was gone and it wouldn’t be terrifying to watch. Bad assumption on my part. That tree was so tall that, even after the top part of it was gone, it was still dizzying to watch the climber walking around up there, attaching the crane before sawing the branches or trunk. It was so fascinating that I could not pull myself away — and in fact, true to form, I had to go for my camera. I’ve never been to the circus, but I can’t imagine it being more thrilling than this. I only wish I had photographed the whole thing from the beginning, when the tree still towered over all the others. One thing that made it somewhat less frightening was the expertise and precision with which they went about the task. Clearly, these folks knew what they were doing. 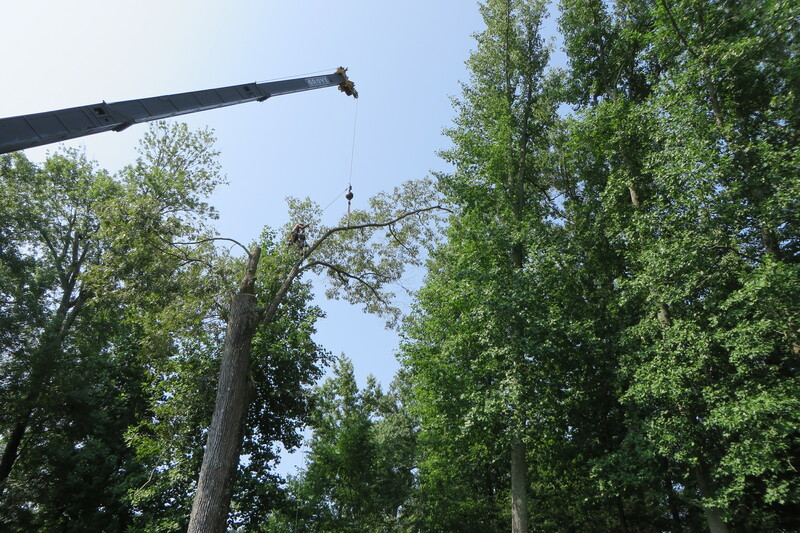 I had somehow imagined someone standing safely inside a cherry-picker sawing all the branches off, but I guess that doesn’t work when there are trunks that weigh several thousand pounds being removed (the heaviest piece they took that day weighed over 8000 pounds). I felt tremendously grateful that there are people who make a career of knowing how to go about such momentous tasks. Ditto for construction workers who build skyscrapers, or first responders who tackle wildfires, or any number of valiant people who are willing to face the considerable risks inherent in keeping our world going. Watching these tree professionals at work, I realized the truth of what Rawls says about ingenuity and resourcefulness. Whoever designed the tools and methods, as well as those who spent the many hours of practice it would take to get good at using them, displayed determined competence that benefits all of us. While their efficiency did not inspire me to learn tree work, it did encourage me to become better at what I have to do. Risk is a part of everyone’s life, though the type and degree of it varies greatly. I’m a cautious person who is averse to taking chances of any kind. Because of this, risk can induce fearful procrastination on my part, or passive avoidance of situations that seem precarious. I need to remember that risk can be used as an incentive to sharpen my perception and get me moving, adjusting circumstances to improve the probability of success and decrease the likelihood of misfortune. What risks are you dealing with right now? How can you transform uncertain situations, using them as assets rather than liabilities? Goodness, just how tall was that tree?! Ann, we never knew how tall the tree was, but I’m guessing over 100 feet. It was the tallest one on the street, and maybe even in the whole neighborhood. Walking up to the house from a distance, it was always easy to see which one it was. Using risk as an incentive is my way of dealing with the jitters that come with all the changes of aging. Although I’m trying to be very, very careful about falls and avoid risks in that category. They say one of the riskiest places one can be is in one’s own home! Hope you have a great weekend. Because I have a decent skill set in a variety of professional areas I appreciate even more the value of hiring professionals to do jobs for me. I am mechanically challenged, being lucky I know where to put the gas in my car or the key in the ignition. I hire competent mechanics, doctors, lawyers and carpet layers just to list a few. Pros make it look easy. Bob, they do make it look easy, and that tricks some of us into learning some frustrating or expensive lessons about knowing when it’s best to turn the job over to pros. Plus I like hiring people because I always find it fascinating to watch how they go about their work. It amazes me how many cool tools and machines there are to do various jobs. Very few people could afford to own and store all the handy gadgets and gizmos that it takes to keep our ever-increasing “stuff” in good shape. Much better to cooperate and work for each other. Carolyn, be careful! With only one “good” hand to steady yourself if you start to trip, it’s bound to be even riskier than usual. I find myself tripping and falling a lot more lately (even though I’ve always been klutzy) and I believe it must be due to age. I hope this weekend brings you some more lovely weather to enjoy from your porch. It is hard to believe it’s nearly autumn. Love to you and Terry. Yes, though I’ve looked at that tree countless times, I had no idea how really big it was until I saw the top branches of it close up. Julia, I could not find the arborist in the tree until I enlarged this photo. His size relative to the tree puts in all in perspective. 8,000 pounds for a slice! That is extraordinary. I’m glad you took this photo and I’m sure you have others of the tree in its prime. What an experience. Yes, it really was something. I hope all the birds and squirrels aren’t mad at us for taking away some of their favorite playgrounds. We can already tell the difference in how hot certain areas of our back rooms get without its shade. Still, there turned out to be enough dead wood and hidden problems in the tree that we feel safer now that it has been removed. Our house and yard were among those damaged in Hurricane Isabel the year before we moved in, and I’ve seen big trees fall since, so it’s scary to have a huge one that might fall or even drop big branches. It’s easy to put off tree work until it’s too late. One of those blessings in disguise, Julia. Though it seems like a million years since we’ve seen a big storm, I know that every time we do at least on large tree comes down, often with deadly coincidences. A neighbor in the middle of our block neglected to remove a dead or dying tree and when it fell in a storm it tore through a power line, sending the line arcing through the back yard pool. Thankfully no one was hurt, but the power was out for half of the street for several days. It is easy to put it off. It’s a huge job and a massive expense and for those of us that love trees, a bit of guilt comes with the package too. Like you though, I can do the right thing when I know it must be done. It’s so much easier to spend money on adding something than on taking something away. Thank goodness most “cleaning out” that I do takes no money, only effort. I tell myself that the costly tree work is a price I’m willing to pay for having healthy trees all around. But we still probably should have them trimmed more often than we do. We know never to top them off, but getting the right kind of trimming and preventive pruning is definitely expensive. It’s expensive but so important to find an arborist to do the work. There is a house near the corner of the school crossing with what was once a magnificent pine. When the house sold, the owners hired someone (not an arborist) to “prune” the tree, but in actuality they hacked off many limbs. It was awful to see that poor tree. It was dead within six months, and they had to remove it altogether. I think its easy to forget that trees are living things in need of proper care. Not everyone with a ladder and a chainsaw can properly prune trees. I was lucky to be able to work for a short time at the Tennessee Division of Forestry, in the main office in Nashville. In the brief time I was there before we married and moved to Memphis, I learned so much about trees, and came to have deep respect for the people who make it a career to be experts in their care (in our Division, being a forester required a college degree at least, but many had Master’s level educations — still, it was the experience that was most impressive). When it was time to remove our giant oak I called the local Virginia forestry office and asked a forester to come out and corroborate the certified arborist’s opinion. In most states, the forestry division will send a forester out to advise in such situations, and won’t charge anything (our tax dollars at work). So with a forester having advised us to remove the tree, and the arborist in charge of removing it, I felt as if we were doing the right thing. It was still hard to spend so much money to do something I didn’t really want to do, but we had 11 years of enjoying that tree, and I knew from having this same arborist do tree work for us before, that it would be well worth it to get an expert. It does make me cringe to see people hacking the tops off of trees, or otherwise damaging them, especially if they are big enough to cause injury or damage if the dead branches that result are likely to fall. As with other blessings, trees require time, resources and attention, but are worth the trouble because they add such beauty to our lives. Julia, is there anything you haven’t done? You have the most fascinating background. I’m really intrigued with your time at the forestry in Memphis, and equally impressed that you could apply that knowledge all these years later. I too cringe when I see trees topped or hacked. There is a lot to be said for many life experiences. I used to fret that I was scattered across many fields, and now consider it a plus. I know a smattering of many things, have met a number of interesting (and challenging) people, and know myself better as a result. Was Jeff in the service before entering dental school, or did that happen in reverse? I’m sure you’ve shared this detail somewhere before, but I can’t recall. When I was trying to decide what to study in graduate school, it was a toss up between speech therapy and library science. Probably never a true contest to begin with, since the latter was a childhood ambition, but one thing that drew me was the qualification summary, which said a broad spectrum of experiences and a good general background were ideal for studying library science. I then began to use my own phrase of the old saying: “Jack of all trades, Master of Library and Information Studies!” 🙂 Seriously, I am grateful for each and ever job I ever had — and there have been many — because I learned in each one of them. Jeff got into the Air Force upon graduation from dental school. At the time, dentistry was an overcrowded field, and a military dental career slot was quite competitive. In fact, he was the only applicant from his entire dental class who was accepted into the Air Force; the year before, I don’t believe anyone got in. People used to assume that his school was paid for by the Air Force, but not so! We spent years paying it off 🙂 but it was our best investment ever. Plus the Air Force did supply his postdoctoral residency training, which was grueling and intense, but something he enjoyed. It has been invaluable as well, in terms of opportunities and professional satisfaction. Sheila, I have occasional problems with vertigo, so that gives me another excuse to avoid the beauty salon (I’m one of those who goes to get my hair cut every three years whether I need it or not). Speaking of which, I just got it cut, so I’m off the hook for another three years. 😀 I don’t do roller coasters or haunted houses either. Why should I go into situations where I will be freaking out even more than I already do? We’ll just sit here on the Verandah and sip our tea, thank you…Hope y’all have a great weekend too! I knew there was some reason I just HAD to have a haircut RIGHT THEN. Now if you tell me you were drinking St. Dalfour’s organic Irish breakfast tea when you wrote this, I might have a true Southern hissy fit. Speaking of Southern, I just read that “We don’t become Southern, we’re born that way”! Of course, we have Southern hissy fits to BEAT THE BAND! ☕️ More java. Sheila, no more java for me. I already drink more cups of tea than you can shake a stick at! Marlene, thanks for celebrating our tree with me, as well as confirming that sometimes, removal is best. Since Matt’s bedroom would have been directly in the path of any falling branches, to say nothing of the damage to the root system that would have resulted from the construction, I’m glad there were enough experts to convince us to make the hard decision. I wish I had more time to spend with you here — I’ll be back as soon as I can! Meanwhile, know that this brief “visit” has cheered my day!